Another year is upon us. We're already a few days in, and for the first time in my life, I still haven't made a list of goals. It's partly because we were out of town doing our family Christmas on New Year's Eve, but it's also partly because I am so tired of making goals for myself that I don't even try to reach. Every year, it's the same stuff for me. Reach my goal weight. Write regularly. Pray and read the Bible daily. Pay off debt. Then I recycle the same sub-goals to reach my primary ones, things like, Exercise 3-5 times weekly for at least 30 minutes. I'm at a point where writing all these things down again isn't going to do much. I know what I need to be doing, and everyday I grow more and more frustrated with myself for not doing those things. This year, instead of drafting a lengthy list of S.M.A.R.T. goals I won't reach, I'm going to try a new technique. I'm going to choose one word for the year. One word upon which I want to build my day-to-day life. I struggle with anxiety. I've always been a worrier, choosing to use my creative talents mainly for concocting worst-case scenarios for day-to-day living rather than for anything beneficial. I tend to dwell on these negative thoughts, and I often end up propelling myself into a panic attack. This isn't good for me, nor is it good for the people around me. I spent the majority of 2016 in this tense, burdensome state of worry. I was pushed to my limits at my job, where I rushed around doing everything within my power to ensure my residents' needs were met, all the while neglecting to take care of my own. When I clocked out, I brought that same stress home with me. I cried as I drove home, reviewing how I had used my life that day. I brooded over the things I'd had to do, how I was forced to ignore some residents when other residents had more pressing issues. There were, after all, thirty or so of them and only one of me. I brooded over the pitiful, processed snack options I had to give my residents, many of whom were diabetics: Snack Pack puddings, Teddy Grahams, or honey buns. I brooded over the fact that most of my job was doling out drugs, the same drugs I'd exposed in argumentative college papers while obtaining my English degree. And here I was, with every plastic pill cup I dispensed, a front and center player in the Big Pharma game. I abhorred the waste I witnessed, the waste to which I had to contribute. I didn't realize it until I started working in a long-term care facility, but the healthcare industry produces a massive amount of garbage daily. From disposable adult diapers to disposable plastic spoons and medicine cups to disposable socks, there is no reusing, no recycling. Everything is tossed away and shipped off out of sight. I wanted to make a difference in this area, but I couldn't. And that ate at me. Essentially, my day-to-day work didn't line up with my values. And this produced anxiety. But I can't only blame my job. My own choices in my personal life gave- and continue to give- me grief. I elude peace each time I say something negative about a person I don't like. Each time I choose a fast food drive-thru over fresh, home-cooked, real food. Every time I give into watching just one more episode on Netflix instead of taking the time to write or read or make something. Each time I find an excuse to not exercise. Every time I think about about sweatshops and capitalism and Fair Trade and shop at Walmart anyway. Every time I swipe my credit card. This goes beyond sabotaging my own goals. I consistently compromise my own values. And each time I do this, I rob myself of peace. 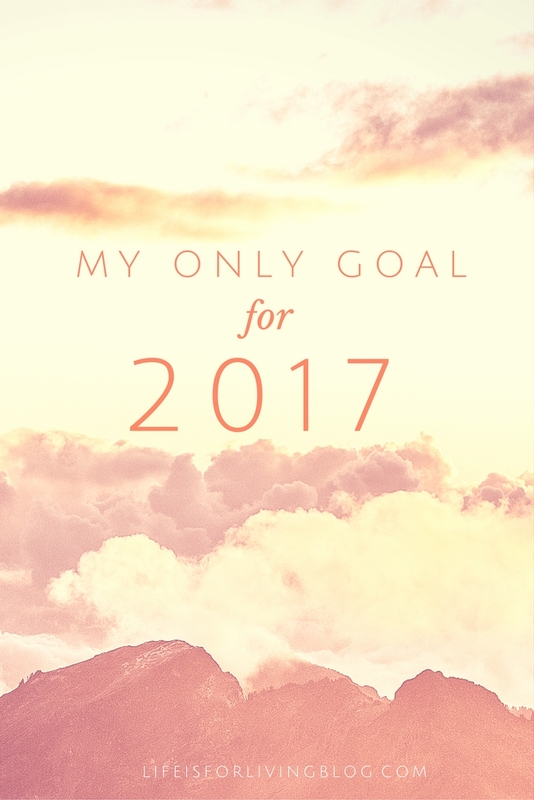 So, for 2017, I want to make just one, simple goal. I want to be more intentional, to truly think before I act or speak, to make sure my thoughts, words, and actions reflect the things I value. Because the older I get, the more I realize that this kind of sincerity is the only way to feel at peace with myself. If you could pick one word to build your 2017 on, what word would you choose? Do you think about how your actions reflect your own personal values? Are you living your life according to them, and if not, what can you do differently to change this? I really like the idea of choosing one word to build the year on! I am gonna work on discovering my word this week. Peace is a good word and I think we all need to strive to get closer to peace, whether it is in our relationships, our consciences, or just the clutter in our own minds. Peace is a good focus word. It's something all of us should remember daily.